Gemini Expect emotions to rise high this week. It's not necessarily bad but to make things easier on everybody, you should give a happy twist on it. Impulsive behavior is in the air this week. Make sure to take a look at the situation from all sides and take a decision once you've done that. Reacting too soon could backfire. You don't want to be making damage control, right? If you're single, chemistry can't be manufactured. It's either there or it's not. You may be head-over-heels in love with that special person but he/she doesn't feel the same way. It's time to move on. Don't let him/her dictate your happiness. Gemini This will be a quiet week, Gemini. You find everything normal. If you take a closer look, you will see how valuable your life actually is. In terms of your social life, you're the kind of soul who can have a lot of fun. You're comfortable being in a large group and calling the shots. Same goes in terms of career; you don't shy away from getting your hands dirty and chasing after your dreams. Your personal life is also quiet peaceful. The realization that you are actually rich and your world is fascinating gives you new energy and strength. Gemini Risks taken this week will pay off quite handsomely. Don't fear the future, but instead have faith in your actions. If you don't want to cause problems, you should count to ten before you give into your anger. Is something bothering you? Talk about it. If you worry about financial issues, you won't solve anything. Solve something by convincing yourself that everything is going to be all right and if you work to improve the situation. Are you in a relationship? Then compromise! Single? Someone for whom you feeling nothing for could express an interest in you. Gemini You will be tested in love again, Gemini. That could irritate you but that doesn't solve anything. The best way to deal with the situation is to have a heart-to-heart talk with your partner. Set ground rules and make sure that both of you deliver. If you have problems with a house or a mortgage, it isn't wise to sit in a corner and wait to see what happens. You could feel a bit down every now and then, but it is good to take action. Every encounter doesn't have to serve as an opportunity to increase your network professionally. Gemini Feelings of love will get all the attention they need this weekend. You might want to sanctify your union. It could involve an exchange of house keys or a diamond on a certain finger. The romance is flourishing and everything will turn out fine with that special someone. Career-wise, a little bird informs you that some developments you know nothing about are going on behind the scenes. Try to find out what is going on, Gemini. Of course, you're capable of making your own decisions but there's nothing wrong with being careful. Hit the brakes every now and then. 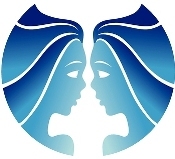 Find out about the Gemini love horoscope and famous Gemini people using the link above.